Defining variables as arrays and using them in expressions. Referring to individual array elements and columns. 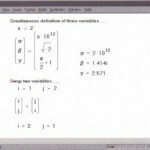 Displaying vectors and matrices . 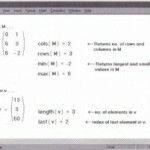 How Mathcad displays answers involving matrices and vectors. Limits on the sizes of arrays to be stored, displayed, or entered. 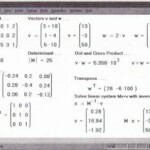 Operators designed for use with vectors and matrices. Built-in functions designed for use with vectors and matrices. 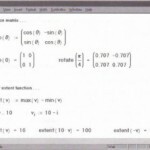 Using Mathcad’s “vectorize” operator to speed calculations. Using vectors to define several variables simultaneously. Using arrays as arguments to user defined functions. Arrays in which the elements are themselves arrays. • By filling in an array of empty placeholders as discussed in this section. This technique is useful for arrays that are not too large. • By using range variables to fill in the elements as discussed in Chapter 11, “Range Variables.” This technique is useful when you have some explicit formula for the elements in terms of their indices. • Click in either a blank space or on a placeholder. • Choose Matrix from the Insert menu, or click on the Vector or Matrix button on the Vectors and Matrices palette. A dialog box appears, as shown on the right. • Enter the number of elements in the text box beside “Rows.” For example, to create a three-element vector, type 3. • Enter 1 n the text box beside “Columns.” Then click “Create.” Mathcad inserts a vector of placeholders. • Click on the top placeholder and type 2. • Move the insertion point to the next placeholder. You can do this by clicking directly on the second placeholder. If you’re going to need several vectors in your calculation, you can leave the Insert Matrix dialog box up for later use. • Press [Space] to enclose the entire vector is now between the editing lines. This ensures that the plus sign you type next will apply to the whole vector rather than to one Of its elements. • Use the Insert Matrix dialog box to create another three-element vector. Fill in this vector by clicking in each placeholder and typing in the numbers shown on the right. • Press the equal sign (=) to see the result. 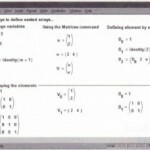 Addition is just one of Mathcad’ vector and matrix operations. Mathcad also includes matrix subtraction, matrix multiplication, dot product, integer powers, determinants, and many other operators and functions for vectors and matrices. Complete lists appear in the sections “Vector and matrix operators” on page 193 and “Vector and matrix functions” on page 196. • Choose Matrix from the Insert menu. The dialog box shown on the right appears. 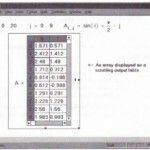 • Enter a number of rows and a number of columns in the appropriate boxes. In this example, there are two rows and three columns. Then click on “Create.” Mathcad inserts a matrix of placeholders. 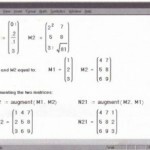 • Fill in the placeholders to complete the matrix as described in the previous section for vectors. • Choose Matrix from the Insert menu The dialog box as shown on the right appears. • If you insert rows, Mathcad creates rows of empty placeholders below the selected element. If you insert columns, Mathcad creates columns of empty placeholders to the right of the selected element. • To insert a row above the top row or a column to the left of the first column, first place the whole matrix between the editing lines. To do so, click in the matrix and press [Space]. Then choose Matrix and proceed as you would normally . •.If you delete rows or columns, Mathcad begins with the row or column occupied by the selected element. Mathcad deletes rows from that element downward and columns from that element rightward. • If you type 0 as the number for “Rows,” Mathcad neither inserts nor deletes rows. If you type 0 as the number for “Columns,” Mathcad neither inserts nor deletes columns. Note that when you delete rows or columns, Mathcad discards the information in the rows or columns you eliminate. To delete an entire matrix or vector, place the entire matrix or vector between the editing lines and choose Cut from the Edit menu.